Russian engineers have a "really, really good idea" about what went wrong during a Soyuz launch to the International Space Station Oct. 11, forcing the ship's two-man crew to carry out an emergency abort, NASA Administrator Jim Bridenstine said Tuesday. He added that he expects the Russians to resume piloted Soyuz flights in December. "While our astronaut and their cosmonaut are home safe, they're not happy," Bridenstine said during a meeting of the National Space Council, chaired by Vice President Mike Pence. "They want to be on the International Space Station, and they cannot wait to go again. So we're grateful for their enthusiasm. NASA is regrouping, we're replanning and we're getting ready to go again." 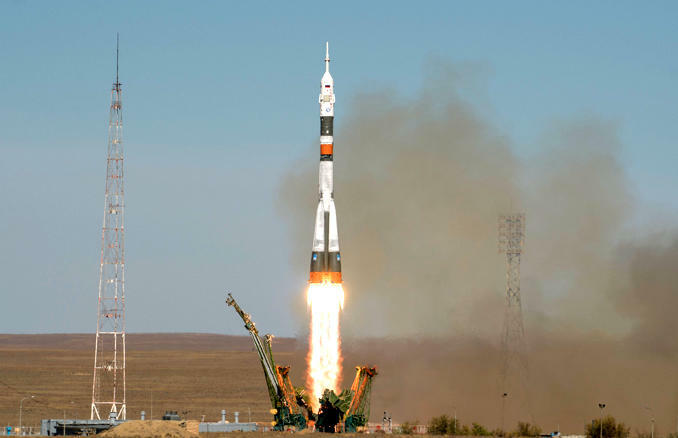 Soyuz MS-10 commander Alexey Ovchinin and NASA flight engineer Nick Hague were forced to abort their launch to the station when one of the normally reliable Soyuz FG booster's four strap-on first-stage rockets apparently crashed into the base of the second stage core vehicle during separation two minutes after liftoff. The Soyuz crew ship's computer detected the problem and fired thrusters to quickly pull the craft away from the malfunctioning rocket. Ovchinin and Hague landed safely about 250 miles from the launch site. But the abort threw a wrench into the station's carefully planned crew rotation schedule and while Ovchinin and Hague are expected to fly again, it's not yet known when. Of more immediate concern to NASA, the Russians and their international partners is when the Soyuz rocket will be cleared to resume flights. A Russian "state commission" investigating the mishap is expected to report its findings around the end of the month. Similar versions of the rocket are scheduled for flight in the coming weeks to launch a polar orbiting weather satellite from Kourou, French Guiana, a Progress space station supply ship from the Baikonur Cosmodrome in Kazakhstan and a Russian navigation satellite from the Plesetsk Cosmodrome. All of those rockets use identical or similar stage one separation systems and if all three of those flights go well, Russia could proceed with the next launch of a space station crew as early as Dec. 3. "We have a number of Russian Soyuz rocket launches in the next month and a half and in December, we're fully anticipating putting our crew on a Russian Soyuz rocket to launch to the International Space Station again," Bridenstine said. "We have a really, really good idea of what the issue is. We're getting very close to understanding it even better so we can confidently launch again. "It is important to note that while this was a failed launch, it was probably the single most successful failed launch we could have imagined." Hague and Ovchinin had hoped to join Expedition 57 commander Alexander Gerst, Serena Auñón-Chancellor and cosmonaut Sergey Prokopyev aboard the station. Gerst and his crewmates were launched aboard the Soyuz MS-09 spacecraft last June and originally planned to return to Earth on Dec. 13. Three fresh crew members -- Oleg Kononenko, Canadian astronaut David Saint-Jacques and NASA astronaut Anne McClain -- were expected to launch on Dec. 20, joining Ovchinin and Hague aboard the lab complex. Now, because of the launch abort, the Russians must launch Kononenko's crew ahead of schedule. By taking off in the first week of December, the new crew would have time to carry out an orderly handover before helping Gerst and his crewmates depart around Dec. 20. They have to leave by early January at the latest or their Soyuz will exceed its on-orbit certification. With the departure of Gerst, Auñón-Chancellor and Prokopyev, Kononenko's crew will have the station to themselves until April when another Soyuz crew is scheduled for takeoff. The original flight plan called for Oleg Skripochka, NASA's Christina Koch and a United Arab Emirates guest astronaut to take off on April 5. The UAE astronaut then would have returned to Earth about 10 days later with Hague and Ovchinin. Thanks to the launch abort, it's not yet known who will fly up to the station next spring or how the flights will be sequenced. In the near term, NASA hopes to press ahead with launch of a Northrup Grumman Cygnus cargo ship atop an Antares booster from Virginia in mid November followed by launch of a SpaceX Dragon supply craft atop a Falcon 9 rocket from Cape Canaveral in December. Two NASA spacewalks to install a second set of batteries for the space station's solar power system are on hold, but likely will be carried out after Kononenko's crew arrives in December. A Russian spacewalk by Prokopyev and Kononenko to inspect the Soyuz MS-09 ferry ship likely will be carried out during the crew handover period in December. A small leak in the spacecraft was found and fixed in September and Russian engineers want to find out how extensive the damage might have been and whether it was caused by a deliberate act at some point during the spacecraft's processing.